This is a little added bonus that we found as we were walking around looking at what was blooming in the garden. Don’t be fooled. 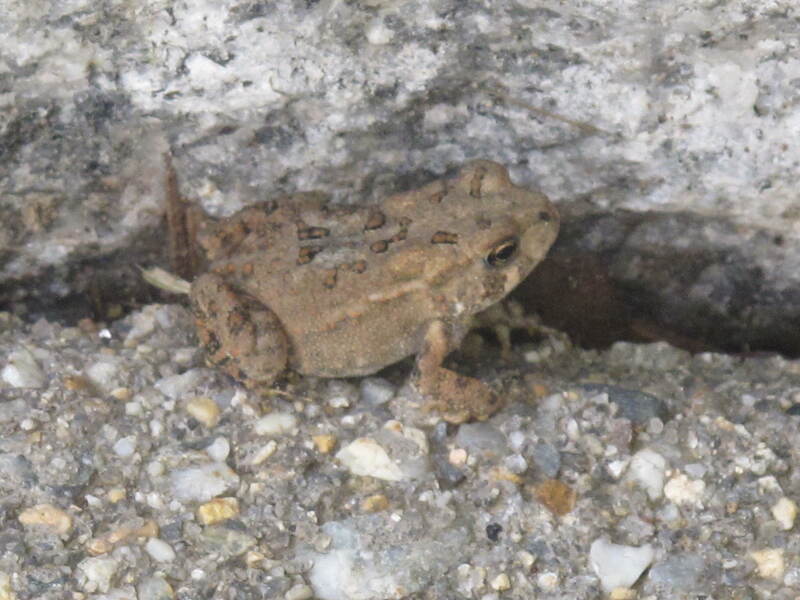 This little toad was no more than a half an inch long….a baby. When I was a little boy, my Grandma would always pull me aside when I yelled at the sight of a toad and give me the benefits of seeing them in your vicinity. They eat bugs that devour your garden. They save our garden. Be happy when you see one near your garden. So I will take her long ago given advice and be happy that our little friend is out protecting our garden. Lot of plants are peaking in our garden right now. Let’s enjoy a little virtual garden tour of what’s blooming. Come with us….and Mr. Baby Toad. An Asiatic lillium. We planted these lilies our first year on Glen Road. I thought the color would be more vivid, but I’m so happy to see them each and every year they bloom. I’m not so vivid either after six years here at Glen Road. We are both getting old! O.K., I bought these long-blooming lilies off of QVC the first year we were here. Not your regular garden source but look at how magnificent they are. What can match this coral color that opens up every day for two months? More QVC good luck. They will be here long after I am. Sometimes a good deal is really a good deal. So sweet and so tender these little yellow blossoms are. Our best ever display of hydrangea ‘picotee’ ever. Ivory and purple colors kill me! So beautiful…those ‘picotee’. How pretty! Close up of ‘picotee’s’ middle. Purple and violet to die for. Elizabeth Taylor’s eye color. Our hosta’s are blooming as well. The rain came at the right time to make our hostas spectacular this year. Buzz….it’s a bee in our ‘picotee’. Notice the little yellow sack at his side. What is that? A pollen bag? We love hydrangeas. Can you get enough of our shots of them? Hope not. I call these zebra hostas. Stripes down the middle kill me. Pure white hydrangea blooms. They say the soil was not acidic enough. I say just plain gorgeous. A Japanese painted fern. I cannot get them to flourish and grow in my garden. Why do you think that is? A blooming Monarda. A favorite shade of red in the garden. Coconut lime echinachea. Bloom baby bloom. So tropical for our front yard. Can you ever get enough hydrangea shots? Not me!! Baby astilbe. Lots to love with this redish bloom. Back from the dead after our Winter construction. Croak….good thing to see in your garden per my Grandma. I hope so!! You know I hate critters. We hope that you enjoyed our little virtual tour. After a heavy rain this Friday night, things are looking pretty good and there is no need for us to haul the sprinklers out. Let’s hope that we can continue to alternate between full sun and then some rain. It sure makes things stay in bloom a lot longer. What is blooming in your garden right now? This entry was posted in The Garden-2011, Wildlife and tagged Acorns, Beauty, Blog, Entertainment, Family, Fun, Gardening, Humor, Life, Lifestyle, Love, My Life, Nature, Photos, Summer, Thoughts. Bookmark the permalink. I agreed … hard to get enough shots of hydrangeas! Lovely! Thanks tbrose. Our hydrangeas have come in great this year. I think it rained at just the right moments. They are spectacular. Come back and visit us soon. I love seeing which animals freak you out and which don’t. Also, I enjoy seeing your garden. Very impressive. Hi Rufus’. The toad was only a half-inch long. When it gets bigger, grows fangs and large talons, then I will be scared. 🙂 Thanks for the comment on the garden. Lots of work, but worth it when it blooms. Come back and visit soon. Hi. Thanks for the comment. I have never heard of a toad house before. I’ll have to check it out. Come back and visit soon. We have nothing blooming in the garden this year. Events came up that delayed planting a garden but still have some beautiful plants we purchased from a greenhouse, replanted in decorative pots and they are still beautiful. Your flowers are beautiful and it must be a good feeling when you look and think “I did this. I created a beautiful thing by planting and taking care of a little plant.” Congratulations. Thanks for the comment Carolkin.